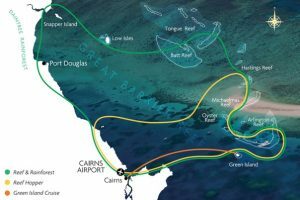 From November 2017 to February 2018 aerial surveys were undertaken off Cairns with GSL aviation to search for whale shark and manta rays on the Great Barrier Reef. 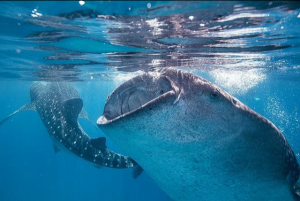 This time of year was chosen due to the best weather opportunities, and a number of whale shark sightings occurring regularly during this Summer season over the last few years. 3) use this information and aerial surveys to tag whale sharks and manta rays with satellite tags. See our previous blog that used aerial survey assistance to locate and attach a satellite tag on to a manta ray and track its progress for 6 months. Unfortunately the elusive whale shark proved to be, well… elusive, none were seen from aerial surveys. During this same period, tourism operators reported seeing whale sharks at Norman Reef and Chinaman Reefs. 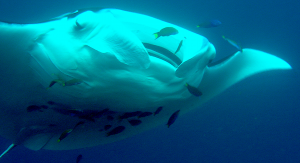 Manta rays were sighted on 48 days and sightings ranged from 1 to 7 mantas. 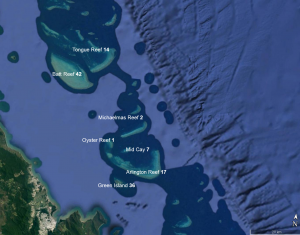 Batt Reef and Green Island had the most mantas sighted (see map listing number of mantas sighted at each reef). Thanks to GSL Aviation for their help collecting sightings. Our capacity to respond to challenges in managing and conserving marine resources is directly proportionate to our knowledge of the marine environment. There is little doubt that science and technology must play a vital role in devising the solutions necessary to overcome problems arising in the marine environment. Technological applications including aerial surveys, remote sensing and drone technology can increase fieldwork efficiency and improve data collection. (http://biopixelresearch.org/research/megamouths/) is funded through the Run for the Reef Marathon (https://www.greatbarrierreefmarathon.com.au/).